Welcome to the Shire of Talmere! Hi! And Welcome to The Shire of Talmere! If you are new to the SCA and live in the Georgia counties of Carroll, Coweta, Haralson, and Troup, we are your local chapter of the Society for Creative Anachronism, or SCA – sca.org. We are also seeing many new faces from areas of Alabama East of Birmingham that are discovering our fair group. Hi, my name is Lady Céleste des Fleurs, mundanely known as (mka) Vicky Wertz. I am the Chatelaine, or Newcomer’s representative, for the Shire of Talmere and am here to help you learn about the SCA and how to become involved. I welcome you to the Society and our fair little shire. The SCA is a worldwide organization dedicated to the study, re-creation, and re-enactment of the pre-17th century world, including Europe, the Middle East, and Asia. We recreate many of the customs and crafts that were present in many cultures of the Middle Ages. From armored fighting, rapier fighting (fencing), archery, to costuming, cooking, games, music, and general revelry, we keep alive the spirit of the era. The Shire of Talmere is part of the Kingdom of Meridies, one of 20 ‘kingdoms’ worldwide. The Kingdom of Meridies is made up of the states of Georgia, Alabama, most of Tennessee and the panhandle of Florida. We are a small group with a big heart. Although there are a few of us that have been with the group for a while, we are slowly growing with many new and fresh faces. We always enjoy welcoming new people interested in learning more about our local shire or simply to learn more about what our organization is all about and what we have to offer them and their family. We attempt to have a class or two a month and hold unofficial rapier (fencing) practice weekly. Dance classes are also held every other Thursday, during the rapier practice. Most of our regular activities are held at the University of West Georgia. 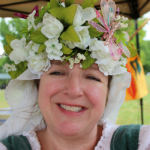 We have classes on topics such as cheese-making, wood-carving, mead-making, soap-making, sewing, calligraphy, learning about herbs and many more topics. Our Arts & Sciences Officer, Rhonwen Verch Ieuan, is always eagerly searching for new classes to keep all of us well educated and entertained. One of our own shire members will teach the class, or we may have an outside guest from a local group teach the class. If you are interested in learning a specific craft that is beyond the knowledge of our shire members, the Kingdom of Meridies, which is the Kingdom in which our fair shire falls, is rich with very well-learned members of a wide variety of skills and talents. You are welcome to attend any groups activities to meet your interests. Our Chatelaine, or Newcomer’s representative, is Lady Céleste Des Fleurs. She can be contacted at: chatelaine@talmere.meridies.org. Our Arts and Sciences Officer, which is the person in charge of classes, is Rhonwen Verch Ieuan. She can be contacted at: artsandsciences@talmere.meridies.org.